The steam required for the cooking vessel is provided by the steam generator. To furnish the diverse requirements of our clients in the best possible manner we are involved in offering an extensive range of Steam Generator. 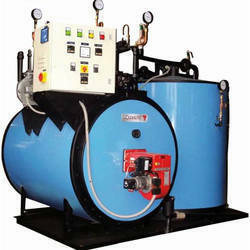 We offer Instant Steam Generator to our clients. - Compact plug & play unit: Skid mounted packaged unit with 3 pass, once through, forced circulation design for instant steam generation. 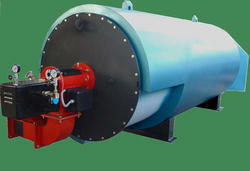 - World class monobloc burner: Ensures silent and efficient operation. Aalborg H/HW boilers are available with vertical or horizontal layouts. The Aalborg H, which is used for steam generation, has an integrated steam space and employs natural circulation. It has been our endeavour at Hi-TECH to offer state of art, well proven, user friendly and future perfected technologies to the Sugar Industry. Introduction of Single Drum, Multi-fuel, High Pressure Industrial boiler would go down the annals of Indian Sugar Industry as a positive contribution from Hi-TECH. The heat from the primary solar working fluid (tubeside) is utilized to convert the condensate (shellside) to steam in a`steam generator. The channel down, two tube pass “U tube design, and kettle type designs are available from the Company.